Get your roll on with Stuffed Pork Cutlets. 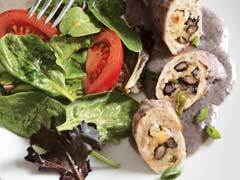 These pork cutlets are stuffed with cheesy black beans and rice. It goes great with a side salad. Reserve 3 Tbsp. of the onions for garnish. Combine remaining onions with rice, 1/3 cup of the beans and the VELVEETA; set aside. Spoon about 1/3 cup of the rice mixture down center of each cutlet; roll up tightly. Heat oil in large nonstick skillet on medium-high heat. Add meat roll-ups, placing seam-side down in skillet; cook 8 to 10 min. or until browned on all sides, turning occasionally. Meanwhile, place remaining beans, broth and sour cream in blender; cover. Blend until smooth. Rearrange meat roll-ups if necessary so roll-ups are seam-side down. Cover with bean sauce. Reduce heat to medium; simmer 15 min. or until sauce is thickened and meat is cooked through. (Do not let sauce boil.) Sprinkle with the reserved onions. Spice up the flavor by adding a chipotle pepper to the sauce ingredients before blending as directed. Look for thinly sliced pork cutlets at the butcher.